We’d love your help. Let us know what’s wrong with this preview of My Sister is Missing by Julia Barrett. Following news of a tragic accident, she suspects the worst and, in turmoil, goes in search of answers. But Jess isn t prepared for what she uncovers . . . or for what happens next. To ask other readers questions about My Sister is Missing, please sign up. 5☆ Twisty, Enthralling, Page Turner! My Sister Is Missing is a perfectly twisty and thrilling Psychological Thriller, that kept me guessing. Oh Wow was I taking on a twisty journey. Just when I thought I had things sussed Julia added another red herring. Steph appears to perfectly happy, she has a gorgeous and loving husband Adam, a beautiful new baby and a loving sister Jess. So why does it feel like she's treading water? Steph has gone missing with new born baby Natalie. She's not taken a mobile or a 5☆ Twisty, Enthralling, Page Turner! She's not taken a mobile or any clothes for Natalie just left without a trace. It's quiet quick to see from a diary type entries that Steph has been having an illicit affair, and now he wants a paternity test to prove Natalie is his baby. He wants to tell Adam all about their affair, that would destroy him and their marriage. She is devastated and scared. She doesn't know what to do or where to turn! Why has Natalie gone missing? Can Jess (Steph's Sister) find her before it's too late? And just what is Adam hiding? My opinions of the characters kept changing throughout, but I loved this as they kept me on my toes. However there was none I disliked. All the characters were well written, believable and strong. First of all I didn't like Steph, but as the plot unfolds I felt nothing but empathy towards her. Jess is such a strong character I admired her, with her sheer determination and love for her sister simply shone through, despite her own demons she was facing up to along the way, she kept grounded and level headed. Some of the subjects are a lil sensitive and touches a fair bit on mental health and some reference to abuse. Which some readers may find difficult to read. But Julia handles the subjects with sensitivity but still makes an impact. I was so enthralled from the first few pages, it had me hooked. I was second guessing throughout, which I love with Psychological Thriller, they un-nerve your judgement. The plot was twisty, pacy, thrilling, had me on edge but when things finally slotted into place it was brilliant. The police procedural aspect, kind of takes a back seat in this one which I actually quiet liked. It was more about The Characters stories and discovering truths, secrets and learning to face up to your fears and facing consequences. Overall this is a Gritty, enthralling, Twisty, Psychological Thriller I Couldn't Put Down. Thank you to Red Door Publishing for this copy which I reviewed honestly and voluntarily. Dash fan leslie hamod wrote: "Wonderful review! So glad you enjoyed this🍎"
This was a very good and solid domestic, suspense story. Step and Adam have a happy marriage and and now after trying for several years to have a baby, beautiful Natalie arrives to complete their family. Steph loves being a new mom even though she is exhausted from lack of sleep and endless new chores that challenge all new moms after having a new baby. Natalie is now the new love of her life and will do everything in her power to keep the baby safe and loved in every way possible. Three weeks aft This was a very good and solid domestic, suspense story. Three weeks after giving birth, Natalie disappears. Adam is distraught and calls Steph's sister Jess right away to help him talk to the police and contact all Steph's friends to hopefully find some clues to where she may have gone. Steph's car is missing but her cellphone and all of her clothes and Natalie's things have been left behind. What has happened to Steph and Natalie? I enjoyed this story very much there were a lot of turns that I didn't see coming and sometimes the story would lead me one way and then sharply turn another way so I really appreciated that the author didn't give the whole story away early in the book as many writers do. There were many complex and realistic life elements going on with Adam and Jess's lives throughout the book as well, so it made the book more suspenseful and dramatic. This novel packed a good punch and was well-written and easy to read. I want to thank Reddoor Publishing and Netgally for this ARC! I have t Suspenseful, complicated, and twisty! This is the first book I've read by this author and I wasn't really thrilled with it. It was an interesting read, fast paced and twisty for sure. I did read it in one sitting, so I somewhat enjoyed it, but the writing was a bit over done. The plot wasn't a new one, but it kept my interest and it was a very easy read . Even though we go in knowing Stephanie goes missing at some point in the book, it is interesting to see how it evolves and how Adam and especially Jess work through it. I was going to give it three stars but took away half a star because this was just an OK read, it didn't blow me away or surprise me much. This wasn't an edge of your seat tension read. And while I thought the ending was wrapped up into too much of a neat little package, which I hate, the finale was just too out there for me. Thank you NetGalley, Red Door Publishing and Julia Barrett for the opportunity to read this book in exchange for an impartial review; all opinions are my own. There is nothing I like more than a great book from a debut author. Unfortunately My Sister is Missing by Julia Barrett missed the mark a bit for me. What it's about: Jess's sister Stephanie seems like she's perfectly happy. She just had a beautiful baby girl Natalie and she's happily married to her husband Adam. But one day she disappears, taking Natalie with her. Jess can't figure out where she would have gone or why. Sure she was a little moody, but aren't most new moms? Plus Adam seems to be hiding something. Jess goes searching for answers, but finds out more than she ever thought possible. I really liked the flow of this book, and I definitely think this author has a lot of potential. There are multiple POVs, short chapters, and secrets which are all things I love. However, the book got confusing at times with obscure character viewpoints, sentences that jumped between people without much sense of who was talking, and a mystery that is really not so mysterious. My Sister is Missing seems to be marketed as a psychological thriller/suspense novel, but I would call it more of a literary/women's fiction novel with a touch of a mystery. There are tough themes that are dealt with really well, and I think the focus was more on those than an actual mystery. Final Thought: While I didn't find this book twisty or that mysterious, I did enjoy reading it. I would recommend to people that read a lot of women's fiction and enjoy books with tough themes that are well done. I would also definitely read more from this author, and will be on the lookout for her next one! This is a debut novel by this author and I enjoyed it very much. It is a tale that centers around family dynamics and mental health. The plot is told from multiple perspectives and divided into three parts. The characters are well formed and fleshed out. There are 2 sisters Stephanie and Jess who compose the majority of the story of family dynamics, secrets, deception, violence and mental health. Steph, the oldest sister is suffering from postpartum psychosis after having her daughter, Natalie. She is having hallucinations that are very real to her and ends up running away with her daughter. The story centers around the sisters discovering family secrets and truths and learning to face up to their fears and facing the consequences. It is a tough read at times as you feel so strongly about the sisters mental health and you are pulling for them to get the help they need. I was not certain as to how the book would end and was waiting for the twist at the end to appear. This book will not let you down in tying most of the storyline plots up at the end. It is definitely a book I would recommend to everyone and give it a solid 4 stars. A good psych thriller about a missing sister. Great writing apart from an obsession with clearing the throat. I must have read the word throat so many times it started to irritate. The characters couldn't seem to speak without some kind of throat issue. Ha ha. ANYWAY that aside (and it was an uncorrected proof I was reading so the copy edit will deal with the repetitive bits) this was an intriguing tale of sisterhood which was unpredictable. Proper review for the blog tour. This book deals with way more than it could manage to, which makes the read overwhelming and underwhelming at the same time. The premise is something i have only too much about- a missing sister and I wished for more in the plot in that area. While a number of events take place which completely twist other parts of plot's flow, I could not take much interest in it. The only factor I like is that the book deals with mental health. Thanks to NetGalley for a review copy for an honest review. With thanks to Netgalley and RedDoor for this ARC in exchange for an open and honest review. Jess wakes up hungover one morning and receives a phone call from her Brother In Law Adam. Jess`s big Sister Steph had gone missing along with Natalie her 3 month old niece. Jess and Steph`s mum died the year before. Jess and her Mum had never gone on and Jess had always been her protector. Jess quickly became suspicious of Adam when he spoke to someone on the phone and quickly left the house. When Jess pressed redial she found he had rung the speaking clock to clear the last number called. Back home Adam claimed to have been driving around looking for Steph but Jess found a suspicious receipt in the floor. Days later Jess followed Adam and found him visiting a stranger in hospital, What was Adam hiding and how was it connected to the disappearance of Steph. My Sister is Missing started well but went on a tangent in the middle, and went off course again at the end. I know the Adam/Jason storyline demonstrated Steph`s psychosis but it was too much. The ending was a bit of a let down because the sisters only achieved acceptance of their pasts. The book was told from the POV of Jess and diary entries from Steph. I was glad The author wrote about the effects of postpartum depression. The excerpts from Steph`s diary were well written and gave the reader a snapshot of her paranoia. This book was an OK read but I don't recommend it. There seems to be an ongoing theme with a lot of books especially psychological thrillers and contemporary novels and women’s fiction that involve around sisters. With that being said I went into reading this book sort of guarded because the best sister theme is being wrote about so much. However this novel did not let me down. This novel had intrigue, well developed characters, stellar writing and it discusses something that is not talked about often with mothers especially new mothers. The add There seems to be an ongoing theme with a lot of books especially psychological thrillers and contemporary novels and women’s fiction that involve around sisters. With that being said I went into reading this book sort of guarded because the best sister theme is being wrote about so much. However this novel did not let me down. The added mystery of is the husband hiding something although a common theme in books in this genre, it never gets old and it was quite thrilling to read. I found this book to be a page turner and would highly recommend it to anyone. What do you do when the big sister who has always been there for you is suddenly missing with her newborn daughter? Julia Barrett's My Sister is Missing will have you on the edge of your seat the whole time you are reading it. Jess has always been able to turn to her sister Steph ever since childhood. 3 weeks ago Steph gave birth to her beautiful daughter Natalie. Like all moms Steph is adapting to motherhood, or is she? This story grips your heart and emotions. Great job! My Sister is Missing is an intense, twisted, psychological thriller, but this one was a little too twisted for me. The story started well and the premise was good but I think the flow of the story wasn’t that great because of too many issues being presented. I lost interest. This was not one of my favorites. I received this book from NetGalley in return for an honest review. I really enjoyed the way that the book kept up the tension and suspense throughout. Can't wait for more from this author. I would like to thank the Author/the Publishers/NetGalley for the opportunity to read this book in exchange for a fair and honest review. I have read some mixed reviews about this book so I wasn't sure what to expect. It did take me a lot longer to read than normal but that was due to some unforeseen circumstances in my personal life and nothing to do with the book. MY SISTER IS MISSING is the debut novel of Julia Barrett and it is intense, emotional, intriguing and even a little twisted. There was so much going on but still it kept you riveted to every page to see what happened next. The story begins with Jess waking one morning wi I have read some mixed reviews about this book so I wasn't sure what to expect. It did take me a lot longer to read than normal but that was due to some unforeseen circumstances in my personal life and nothing to do with the book. The story begins with Jess waking one morning with a killer hangover (why are all the women in books I am reading at the moment always downing bottles of wine?) and a phone call from her brother in law, Adam. Her older - and often wiser - sister Steph has gone missing with her newborn daughter of 3 weeks, Natalie. It is so out of character for Steph that it throws Jess into action as she rushes to Adam and Steph's place in affluent Epping. Ever since childhood, Steph had always been there for Jess; had always been her protector and someone she could always turn to. So what had happened to her sister to make her suddenly run with her newborn baby? Sure, she was a new mum adjusting to motherhood, but both Jess and Adam thought she was doing just fine. They both thought how peaceful she looked when feeding Natalie. Surely, she had been fine...hadn't she? But if she had, then why run? She's not taken her mobile or any clothes for Natalie. She has just left without a trace. Jess finds herself supporting Adam as well as herself as they take their suspicions to the police. They go through the motions of reporting Steph missing and, given that she has their newborn daughter who is just 3 weeks old, her disappearance is given high priority. The police ask them questions as to where Steph might go? Any family? Friends? Anywhere special? Neither have a clue. It isn't long before Jess begins to finds Adam's behaviour somewhat erratic. He goes from bawling mess to calm and collected. She becomes suspicious that he is hiding something when she overhears him in hushed tones on the phone and abruptly left the house. When Jess pressed "redial" she found he's called the speaking clock to clear the last number he had called. Why? What is he hiding? When Adam returns home he claims to have been "just driving around" looking for Steph but when Jess finds a suspicious receipt and then the next day sees him driving out of the hospital car park, she decides to follow him. Days later Jess follows Adam to find him visiting a stranger in hospital, whom the staff believe to be his brother. She also discovers that the receipt she'd found resembles the parking tickets for the hospital car park. Why has he been visiting the hospital every day when he says he is out looking for Steph? What is Adam hiding? And how is it connected to Steph's disappearance? Jess and Steph grew up in Sheffield. Would Steph go back there? Surely not, Jess thinks. There is nothing for them there. But when the police discover through the ANPR (automated number plate recognition) system that Steph's car was registered on the road leading to Sheffield, and CCTV has seen her in a Sheffield car park, Jess begins to wonder. Then news comes through that a woman matching Steph's description holding what appears to be a baby jump in front of a train at a Sheffield train station. Adam is beside himself, believing that Steph has fallen to such depths once again, taking their daughter with them. But Jess refuses to believe her sister has taken her life. Then Jess finds Steph's diary and what she reads shocks her to the core. In it, Steph writes that she had been having an affair and "he" wants a paternity test to prove Natalie is or isn't his. She writes he also wants to tell Adam about their affair but it would destroy him and their marriage. What can she do? Her mum, ever the voice of reason, helps her decide what to do. The only problem is...Jess and Steph's mum died a year ago. Surely Steph doesn't think she is still alive? What has happened to Steph that she had missed seeing? It is in that moment, Jess thinks she knows where Steph has gone. It's the only thing that makes sense. So Jess takes to the road in search of her missing sister and niece. MY SISTER IS MISSING is completely enthralling that keeps you second guessing. I did find there to be an excess of monologuing from Jess' POV (which I'm never a fan of) and would prefer a little more dialogue. But I guess that is the nature of the story as well - the fact they each character is dealing with their own demons and their own secrets that no one else knows. We know from the start that Jess had an unhappy childhood and an incredibly difficult relationship with her mother. Throughout the story we get snippets of Jess' experiences as a child at the hands of her mother and it's not until she decides to finally unburden herself to her boyfriend, that we get the bigger picture. Jess' mother always blamed her for their father leaving them. But Jess knew she must be right because she had seen something so confusing to her 5 year old mind that she decided to tell her father in the hope that he could help her make some sense of it. Instead he told her he would always love her...and he left. Their mother's response was to blame her and subsequently abuse her frequently. While their mother doted on Steph, giving her everything, she gave Jess nothing. She often told Steph that Jess was looking after an elderly neighbour instead of letting her go out. She also said Jess was ill but instead had locked her in a cupboard. Steph always got new clothes while Jess only got her hand-me-downs. Jess was never allowed out, never allowed to go anywhere, never allowed to have a life. One day Jess told her teacher what was happening at home, and because her mother was well-known in the community, her teacher told her to stop telling lies. From that day on, Jess knew to keep her secrets to herself. Telling them only made people leave, made them hate her and blame her. In her 5 year old mind, keeping secrets was the only way to make it through life in one piece. But whilst Steph may have been her mother's favourite, she did not lead the charmed life Jess thought she did. Steph had witnessed something as a teenager so disturbing that, together with an equally horrifying experience later at Uni, she created the delusions in her mind that twisted her reality which she began to write about in her diary. MY SISTER IS MISSING is told primarily from Jess' POV, but also various diary entries by Steph and the odd POV from Adam. It's a twisted psychological thriller that takes precedence with each characters' individual stories, secrets and truths, while the police procedural aspect remains in the background. This is Jess and Steph's story. Ironically, I didn't not like anyone, which for me is unusual as there is always someone I don't like. I'm not a fan of strong ball-breaking women but with Jess I felt a little different - maybe due to her past which we became privy to early on in the story. I didn't love her, but I didn't hate her either. MY SISTER IS MISSING touches on some sensitive subjects which I think were handled well. Abuse is always a popular theme but mental health and post-natal depression isn't. I think the author did this quite well as it's not a often subject talked about. You're supposed to be overwhelmed with love and basking in the glow of motherhood, but that is not always the case. The author has handled the issues with sensitivity, giving the reader a real feeling of empathy, while still making an impact. Overall, while I thought MY SISTER IS MISSING could have been better - as it did feel like it was it went off on a little tangent for a while - it was still gritty, compelling, intriguing and totally twisted! I thought the aspects dealing with their mother was a clever way to give the women closure. Despite its difference, I thought the ending was rather apt - which surprised me. There really was no other way to end it but with a sense of closure. 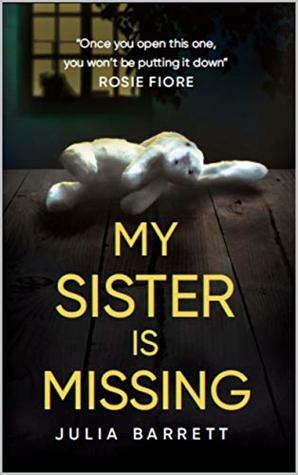 Thank you to #JuliaBarrett, #NetGalley and #RedDoorPublishing for an ARC of #MySisterIsMissing in exchange for an honest review. Thanks to NetGalley for an ARC in return for my honest review. My Sister is Missing by Julia Barrett is about Julia who finds out her sister and niece have gone missing. The book goes into where is Steph (the missing sister) but also delves into the issues of mental health, dysfunctional families and relationships where interdependency can lead to misunderstandings and distrust. I didn't really feel it was much a missing book. This book had the premise of being a great book but it fell short. I Thanks to NetGalley for an ARC in return for my honest review. This book had the premise of being a great book but it fell short. I was pretty bored towards the middle of the book, the twists weren't that interesting. Perhaps if this book just focused on mental health issues, it would have been a great book. The aspects of the book which focused on mental health, dysfunctional families and relationships were good. In Steph’s dialogue I was confused as to why the letter A represented Adam’s name and the letter N represented Natalie’s name? Why not write out the names instead of the first initial? This bothered me. This book had the premise of being a great book. It fell short for me by its delivery. I wasn’t a fan of the way the information unfolded. I skimmed this one thinking something grander was awaiting towards the end. Nothing significant happened. It felt anticlimactic. This was not a missing persons In Steph’s dialogue I was confused as to why the letter A represented Adam’s name and the letter N represented Natalie’s name? Why not write out the names instead of the first initial? This bothered me. This book had the premise of being a great book. It fell short for me by its delivery. I wasn’t a fan of the way the information unfolded. I skimmed this one thinking something grander was awaiting towards the end. Nothing significant happened. It felt anticlimactic. This was not a missing persons story in the typical way that people go missing. It wasn’t a psychological thriller. I wasn’t entertained nor thrilled. There were too many variables taking place at once. It was difficult to sort out with the unusual timeframe and multiple points of view. I think if the author focused on the mental health issue differently this could have been a great story. It didn’t flow or transition smoothly. It was choppy. Jess learns her sister Steph and niece Natalie is missing. She doesn't understand why her sister would leave her husband Adam. As she tries found out what what happen to her sister and neice she dealing with her own issues. As I was reading this it was getting a bit boring and I find myself about to skip toward the end of the book but I didn't because I wanted to know what happen to Steph. It deals with mental illness Jess and I received an ARC via NetGalley in exchange for an honest review. (I received an ARC of this book from Netgalley in exchange for an honest review.) I did not like this book. I read the whole thing, expecting something big to happen or be revealed, and it just never materialized. It seemed like a bunch of little stories woven together, and they just didn't fit together well. I wouldn't recommend. Where to start with My Sister Is Missing? I thought I would be reading a straight forward crime thriller but what I ended up with a complex multilayered tale that dealt with so many human emotions pushed to the extreme. I really liked the character of Jess. She, like many of us, focusses on herself but her world is thrown into turmoil when her big sister Steph goes missing with her new baby. I totally felt Jess’ fear for her sister in this. The thought of one of my siblings going missing fills me Where to start with My Sister Is Missing? I thought I would be reading a straight forward crime thriller but what I ended up with a complex multilayered tale that dealt with so many human emotions pushed to the extreme. I really liked the character of Jess. She, like many of us, focusses on herself but her world is thrown into turmoil when her big sister Steph goes missing with her new baby. I totally felt Jess’ fear for her sister in this. The thought of one of my siblings going missing fills me with dread so compounding that with such a small life is incomprehensible. As the story unfolded on the pages before me, I really didn’t know what to think. Had Steph done the unthinkable to herself and possibly the baby? Had the baby’s father done something? Or had Steph simply wanted to get away from real life for a wee while? The possibilities spun round in my head with me unable to settle on which way to head. My Sister is Missing is classified as a physiological thriller that follows Jess as she tries to unravel the mystery behind her sister, Stephanie's disappearance. One day, Steph's husband, Adam comes home and Stephanie and their newborn daughter, Natalie are missing. Slowly Jess starts to piece things together and she soon learns that there's more than just meets the eye. I will admit that I struggled with getting all of my thoughts together after finishing this novel. On one hand, I read it in o My Sister is Missing is classified as a physiological thriller that follows Jess as she tries to unravel the mystery behind her sister, Stephanie's disappearance. One day, Steph's husband, Adam comes home and Stephanie and their newborn daughter, Natalie are missing. Slowly Jess starts to piece things together and she soon learns that there's more than just meets the eye. I will admit that I struggled with getting all of my thoughts together after finishing this novel. On one hand, I read it in one sitting because I couldn't put it down. But on the other hand, I'm not sure if it's because I was enjoying it or if it's just because I wanted to know what happened to Stephanie. This book had the potential to be amazing because the premise is so damn good; but it just fell flat in delivery. I guess I just wanted more than what I got from this novel. Mostly, I wanted to be able to connect with the characters a little more. The plot was also a little all over the place at parts and at other parts, was very repetitive and it worked on my nerves throughout my reading experience. I will say that I do like and appreciate some of the topics that were brought up in this novel. As well as the conversation that was started in the acknowledgements at the end; but as a whole, this was just not the book for me. Overall, I didn't have a bad reading experience; but it wasn't the greatest. I enjoyed the premise of the novel - but the execution fell flat. Honestly, I'm mostly just confused as to how I really feel about this. QOTD: Do you keep a diary? If yes, how old were you when you started? My Sister is Missing by Julia Barrett is a nail-biting, mindboggling, and thrilling novel. Ms. Barrett takes her readers on an emotional rollercoaster from page one to the end of the book. This is the story of two sisters, Jess and Steph. Steph has gone missing with her three weeks old baby girl. Steph had a traumatic event in her youth which plummeted her into a deep depression and almost cost her life. In the past few weeks, she has been very emotional and demonstrated signs of post-natal depression. Finding her is a top priority. Jess and Steph’s husband Adam are trying to figure out what might have happened and where Steph has gone. Everyone has secrets, some bigger than others. Secrets eat at you slowly until there is nothing left to keep them hidden anymore. Once they are out, they can be dangerous. They can even make you do things you never thought you were capable to do. This debut novel is a mindboggling read. It will keep you on the edge of your seat. My Sister is Missing by Julia Barrett is now available at your favourite bookstore. Thank you RedDoor Books for including me in this blog tour and for sending me an advanced reader’s copy of this book. Jess is convinced that Adam is hiding something. Is he telling the truth about the state of his relationship with her sister? But Jess is holding back secrets too and starts to delve into their troubled childhood, hoping to discover a reason for her sister's disappearance. The main story is told from Jess's point of view, inter Steph has vanished with her newborn baby. Fearing for their safety, her husband Adam and sister Jess try and work out what has driven a seemingly happy Steph to the edge. The main story is told from Jess's point of view, interspersed with Adam's POV and Steph's diary entries. As the truth starts to unravel, Jess realises she doesn't know her big sister as well as she thought she did. This is a gripping thriller which left me quite anxious halfway through! The reasons and resolutions to Steph's problems run much deeper than the average thriller. There is much to admire in this well-written debut. This is the debut novel by Julia Barrett and I will certainly be seeking out more from this author. It is an engaging story and with numerous twists and turns that kept me guessing throughout. The author delves into the issues of mental health, dysfunctional families and relationships where interdependency can lead to misunderstandings and distrust. Stephanie, married to Adam, is the older sister of Jess whose partner, Matt, has gone travelling ‘to find himself’ because of arguments him and Jess This is the debut novel by Julia Barrett and I will certainly be seeking out more from this author. It is an engaging story and with numerous twists and turns that kept me guessing throughout. The author delves into the issues of mental health, dysfunctional families and relationships where interdependency can lead to misunderstandings and distrust. Adam contacts Jess one morning when Steph has been missing all night and she has taken their newborn baby girl. Totally out of character for Steph, they talk to the police and are both beside themselves with worry. All is not as it seems and the different nuances of the relationships begin to show. When there is a report of a woman, holding a baby, jumping in front of a train Jess can’t believe it is her sister and as the video footage isn’t clear she sets out to track her down after reading the journals her sister has been writing in daily. Meanwhile Adam is behaving strangely and the trust between Jess and Adam is at a low point. Thanks to NetGalley, RedDoor Publishing and Julia Barrett for my ARC in return for my honest review. A thought provoking, compelling story, which I couldn't put down. The blurb for My Sister is Missing describes it as a psychological thriller but, as with many of the books described in that way, I think it's actually more of a psychological or domestic drama. Jess's sister, Steph, has just had a baby girl when, inexplicably and out of the blue, Steph and baby Natalie go missing. Jess races to be with Adam, Steph's husband, as they despair, consult the police and carry out their own investigations. Where is Steph? Why has she disappeared? Is Natalie ok? All que The blurb for My Sister is Missing describes it as a psychological thriller but, as with many of the books described in that way, I think it's actually more of a psychological or domestic drama. Jess's sister, Steph, has just had a baby girl when, inexplicably and out of the blue, Steph and baby Natalie go missing. Jess races to be with Adam, Steph's husband, as they despair, consult the police and carry out their own investigations. Where is Steph? Why has she disappeared? Is Natalie ok? All questions that form a big part of the story. There are demons in the sisters' past, ones which may or may not be affecting the present. However, the overarching theme of this novel is one of post-partum psychosis, an important and brave subject for the author to tackle. The consequences of this are far-reaching, for all involved and particularly for Adam, in ways that nobody could have imagined. My Sister is Missing is full of suspense, full of drama. It's quite a slow burner of a story, one where I questioned what was real and what wasn't, whether what the characters were experiencing was truly what happened or not. I thought Julia Barrett did a good job at portraying the mind games that post-partum psychosis initiates and the doubts that form as part of that. One nice surprise for me was that some of the action is set in Sheffield, my home city. I didn't know that was going to happen and so I was really pleased about it. The various settings are important throughout the book actually. This is an interesting tale of family, sisterhood, post-partum psychosis and how the past can continue to affect you long after you think it's over and done with. I have to admit that I was a little disappointed with the ending which I thought might have gone with more of a bang but overall I thought it was an accomplished debut novel and I'd definitely read another book by Julia Barrett. So here is another book about sisters’ which tend to be rather prolific at the moment, we are all dealt the saccharin BS that a sister is a best friend .. maybe in some cases, others not so much! Anyway I digress, big sis Stephanie has done a runner taking her tiny 3 month old daughter with her. Hubby Adam should be beside himself with worry as he approaches the younger sister Jess to help find her. What could have happened, where is she, why has she gone? Jess tackles the search, roles are rever So here is another book about sisters’ which tend to be rather prolific at the moment, we are all dealt the saccharin BS that a sister is a best friend .. maybe in some cases, others not so much! Anyway I digress, big sis Stephanie has done a runner taking her tiny 3 month old daughter with her. Hubby Adam should be beside himself with worry as he approaches the younger sister Jess to help find her. What could have happened, where is she, why has she gone? Jess tackles the search, roles are reversed it’s usually Steph who is the protector. This book approaches the story from various points of view, Steph’s via her diary entries. For once the subject of post natal/partum depression is raised and dealt with quite well. There is certainly a flow of intrigue, this is a very dysfunctional family so the disappearance possibly shouldn’t seem so odd. 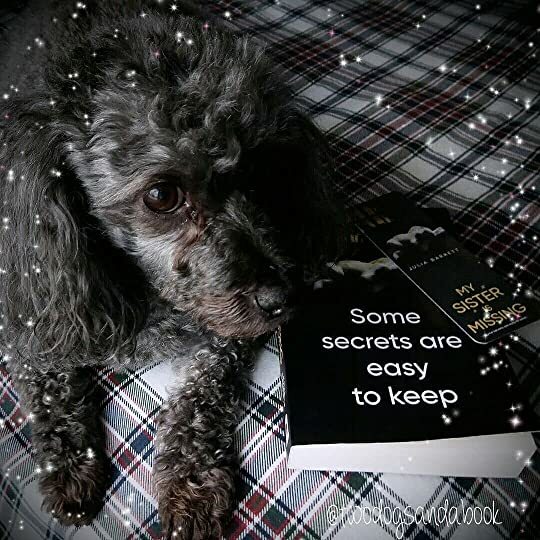 Jess unravels secrets, are secrets sometimes best left buried? The writing in places is fine and the feeling of suspense fairly believable it can then become rather convoluted to the point where I wasn’t sure if I cared whether she was located or what the cause behind it was. I may be a bit biased because personal circumstances at present mean I struggle to get into a book unless it’s an absolute stonker but I think I gave My Sister is Missing a fair chance. I read from beginning to end, there was a bit of repetition but this was an ARC. I suspect details will be tightened up before release so I overlooked those. As a story it was an easy read, not sure I would classify it as a psych thriller but definitely one to grab from a library as holiday or weekend entertainment. Julia Barrett began her working life as a primary school teacher. She has worked in Public Relations for the NHS and as an in-house journalist for Queen Mary, University of London. She has a BA in English Literature from the University of Hull. She is a Faber Academy alumna and is currently working towards the completion of an MA in Creative Writing at Royal Holloway, University of London. She gre Julia Barrett began her working life as a primary school teacher. She has worked in Public Relations for the NHS and as an in-house journalist for Queen Mary, University of London. She has a BA in English Literature from the University of Hull. She is a Faber Academy alumna and is currently working towards the completion of an MA in Creative Writing at Royal Holloway, University of London. She grew up in Yorkshire and now lives in Essex with her husband and two children.